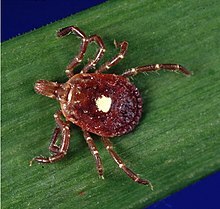 The lone star tick is one of the parasites that the marsh rice rat shares with other mammals. A variety of parasites have been recorded from the marsh rice rat (Oryzomys palustris), a semiaquatic rodent found in the eastern and southern United States, north to New Jersey and Kansas and south to Florida and Texas, and in Tamaulipas, far northeastern Mexico. Some of these parasites are endoparasites, internal parasites, while others are ectoparasites, external parasites. Parasitologist John Kinsella compared the endoparasites of marsh rice rats in a saltwater marsh at Cedar Key and a freshwater marsh at Paynes Prairie, both in Florida, in a 1988 study. He found a total of 45 species, a number unequaled in rodents. This may be related to the diverse habitats the rice rat uses and to its omnivorous diet; it eats a variety of animals which may serve as intermediate hosts of various parasites. The endoparasites in the saltwater marsh were dominated by trematodes (flukes), and those of the freshwater marsh by nematodes (roundworms). Endoparasites were found in the gastric mucosa (which lines the stomach), the cavity of the stomach, the small intestine, the cecum, the large intestine, the pancreatic duct, the bile ducts, the mucus of the liver, the pulmonary arteries, the abdominal cavity, and the pleural cavity. While the marsh rice rat harbors a number of host-specific species, such as the nematode Aonchotheca forresteri, other parasite species, such as the lone star tick (pictured), are shared with other mammals. Compared to the hispid cotton rat (Sigmodon hispidus), Florida marsh rice rats usually harbor fewer individual ectoparasites of each species. Borrelia, the bacterium that causes Lyme disease, has been identified in some ticks that infect the marsh rice rat and it has been identified as a possible natural reservoir for Borrelia. Name The scientific name of the parasite species. A note is given where a species has been recorded on the marsh rice rat under different scientific names. Unnamed species are indicated with "sp." and parasites that could not be identified to species level are indicated with "unidentified". Geographic occurrence U.S. states where the parasite has been recorded on the marsh rice rat (no parasite records are available from the Mexican distribution of the marsh rice rat). This information is unavailable for some parasites. Prevalence Prevalence of infection with the parasite in a studied marsh rice rat population. The prevalence is given either as a percentage (e.g., 10%) or as a fraction (e.g., 5/50, meaning that 5 out of 50 examined animals were infected with the parasite), together with the site of study. Prevalence figures are unavailable for some parasites. Present on other species? "Yes" indicates that the parasite has also been recorded on other host species, "no" that it is (as far as known) specific to the marsh rice rat. For some unnamed species, the sources do not indicate whether or not the species is specific to the marsh rice rat. The Acari include the mites and ticks. Many are parasites of other animals. One study in South Carolina failed to find ticks on marsh rice rats living in marshes, which are an unsuitable habitat for the parasites. Sucking lice (Anoplura) are a diverse group infecting placental mammals. Species found on marsh rice rats include three of the common genus Hoplopleura and Polyplax spinulosa, which more usually infects black and brown rats. Fleas (Siphonaptera) are common parasites of vertebrates, mainly mammals. Several species of fleas have been found on the marsh rice rat. Unless otherwise specified, all information in this section is from Kinsella (1988, table 1). Nematodes are among the largest animal phyla and include at least 12,000 known species that are parasites of vertebrates. In Kinsella's 1988 study in Florida, species diversity was higher in the saltwater marsh (Cedar Key) than the freshwater marsh (Paynes Prairie), but nematodes at Paynes Prairie occurred more commonly and made up the bulk of the parasites found in rice rats there. Four tapeworms are known from the marsh rice rat, all in Florida, but three of those are usually found in other species and only rarely in the rice rat. Flukes (Trematoda) from the subclass Digenea are common parasites of small mammals with complex life cycles. In his 1988 study, Kinsella found an unprecedented 21 species of trematodes in Florida marsh rice rats. The intermediate hosts of these trematodes include a variety of invertebrates, fish, and amphibians, which are eaten by the marsh rice rat. Trematodes were generally more common at the Cedar Key saltwater marsh than at the freshwater marsh in Paynes Prairie. Pentastomida is an enigmatic group of parasites that may be related to maxillopod crustaceans. One species, Porocephalus crotali, is known from the marsh rice rat. It infects various mammals in the southeastern United States, which serve as intermediate hosts; snakes which eat those mammals are the definitive hosts. Apicomplexa is a major group of unicellular eukaryotes that encompasses several important parasites, including the malaria parasite Plasmodium. Three species are known from the marsh rice rat, all of which belong to the Eimerina clade. Two are in the genus Eimeria, members of which cause the economically significant disease coccidiosis in poultry. The third is a member of Isospora, which includes species that are pathogenic in humans and pigs. ^ Previously reported as Haemolaelaps glasgowi, but that name is a synonym of Androlaelaps fahrenholzi. ^ The Gigantolaelaps mite from the marsh rice rat was first described as Gigantolaelaps cricetidarum, a separate species, but later considered identical with G. mattogrossensis; some still consider the two to be different species. ^ Laelaps oryzomydis is a synonym. ^ Previously known as Bdellonyssus bacoti, but since reassigned to Ornithonyssus. ^ Originally assigned to Bdellonyssus (spelled Bdelonyssus), but that name is a synonym of Ornithonyssus. ^ Previously reported as Chilodiscoides oryzomys, but now assigned to Oryzomysia. ^ Previously known as Listrophorus bakeri, but since assigned to the genus Prolistrophorus. ^ Listed as Hoplopleura quadridentata by Worth (1950), but later described as a separate species, Hoplopleura oryzomydis. ^ Originally placed in the genus Capillaria, but later reassigned to Aonchotheca. ^ Because females of these three species cannot be distinguished, data were combined. ^ Originally named Angiostrongylus schmidti by Kinsella (1971), but moved to Parastrongylus by Ubelaker (1986). ^ Females of these two species cannot be distinguished, so data were combined. ^ Listed as Skrjabinoclava thapari by Kinsella (1988), but later described as a separate species. ^ Listed as Stictodora cursitans by Kinsella (1988), but moved to Acantothrema in 2003. ^ Listed as Ascocotyle mollienisicola by Kinsella (1988), but that name is a synonym of A. pindoramensis. ^ Spelled Brachylaeme by Kinsella (1988). ^ Reported as Parvatrema sp. by Kinsella (1988), but later described as Gymnophalloides heardi. ^ Reported as Levinseniella sp. by Kinsella (1988), and described as L. deblocki in 1995. ^ Reported as Maritrema sp. II by Kinsella (1988), then described as the only member of its own genus, Floridatrema heardi, and later again assigned to the genus Maritrema. ^ This species was called prosthrometra by Kinsella (1988); the correct spelling is prosthometra. Anderson, R.C. and Wong, P.L. 1994. Skrjabinoclava kinsellai n. sp. (Nematoda: Acuarioidea) from the rice rat Oryzomys palustris in Florida. Systematic Parasitology 28:1–4. Barnard, W.P., Ernst, J.V. and Roper, R.A. 1971a. Eimeria kinsellai sp. n. (Protozoa: Eimeriidae) in a marsh rice rat Oryzomys palustris from Florida. Journal of Protozoology 18(3):546–547. Barnard, W.P., Ernst, J.V. and Stevens, R.O. 1971b. Eimeria palustris sp. n. and Isospora hammondi sp. n. (Coccidia: Eimeriidae) from the marsh rice rat, Oryzomys palustris (Harlan) (subscription required). The Journal of Parasitology 57(6):1293–1296. Beck, H.-P., Blake, D., Dardé, M.-L., Felger, I., Pedraza-Díaz, S., Regidor-Cerrillo, J., Gómez-Bautista, M., Ortega-Mora, L.M., Putignani, L., Shiels, B., Tait, A. and Weir, W. 2009. Molecular approaches to diversity of populations of apicomplexan parasites (subscription required). International Journal for Parasitology 39(2):175–189. Borror, Donald J., and White, Richard E. 1970. A Field Guide to the Insects. Boston: Houghton Mifflin. Brookins, M.D., Wellehan, J.F.X., Jr., Roberts, J.F., Allison, K., Curran, S.S., Childress, A.L. and Greiner, E.C. 2009. Massive visceral pentastomiasis caused by Porocephalus crotali in a dog (subscription required). Veterinary Pathology 46(3):460–463. Bush, A.O. and Kinsella, J.M. 1972. A natural definitive host for Catatropis johnstoni Martin, 1956 (Trematoda: Notocotylidae), with notes on experimental host specificity and intraspecific variation (subscription required). The Journal of Parasitology 58(4):843–845. Carmichael, J.A., Strauss, R.E. and McIntyre, N.E. 2007. Seasonal variation of North American form of Gigantolaelaps mattogrossensis (Acari: Laelapidae) on marsh rice rat in southern coastal Texas (subscription required). Journal of Medical Entomology 44(1):80–84. Ching, H.L. 1995. Four new gymnophallid digeneans from rice rats, willets, and molluscs in Florida. Journal of Parasitology 81(6):924–928. Clark, K.L. and Durden, L.A. 2002. Parasitic arthropods of small mammals in Mississippi (subscription required). Journal of Mammalogy 83(4):1039–1048. Clark, K.L., Oliver, J.H., Jr., Grego, J.M., James, A.M., Durden, L.A. and Banks, C.W. 2001. Host associations of ticks parasitizing rodents at Borrelia burgdorferi enzootic sites in South Carolina (subscription required). Journal of Parasitology 87(6):1379–1386. Deblock, S. and Heard, R.W. 1969. Contribution à l'étude des Microphallidae Travassos, 1920 (Trematoda). 21. Description de Maritrema prosthometra n. sp. et de Longiductotrema nov. gen. parasites d'oiseaux Ralliformes d'Amerique du Nord. Annales de Parasitologie Humaine et Comparée 44:415–424. Denton, J.F. and Kinsella, J.M. 1972. Lyperosomum intermedium sp. n. (Digenea: Dicrocoeliidae) from the rice rat, Oryzomys palustris, from southeastern salt marshes (subscription required). The Journal of Parasitology 58(2):226–228. Diaw, O.T. 1976. Contribution a l'etude de nematodes Trichostrongyloidea parasites de xenarthre, marsupiaux et rongeurs neotropicaux. Bulletin de la Muséum National de la Histoire Naturel de Paris (Zoologie) 282:1065–1089. Ditrich, O., Scholz, T. and Vargas-Vázquez, J. 1996. Life-cycle of Echinochasmus macrocaudatus n. sp. (Trematoda: Echinostomatidae) (subscription required). Systematic Parasitology 33(3):225–235. Doran, D.J. 1955. A catalogue of the Protozoa and helminths of North American rodents. III. Nematoda (subscription required). American Midland Naturalist 53(1):162–175. Durden, L.A. 1988. The spiny rat louse, Polyplax spinulosa, as a parasite of the rice rat, Oryzomys palustris, in North America (subscription required). The Journal of Parasitology 74(5):900–901. Durden, L.A. and Kollars, T.M., Jr. 1997. The fleas (Siphonaptera) of Tennessee. Journal of Vector Ecology 22(1):13–22. Durden, L.A. and Musser, G.G. 1994. The sucking lice (Insecta, Anoplura) of the world: a taxonomic checklist with records of mammalian hosts and geographical distributions. Bulletin of the American Museum of Natural History 218:1–90. Durden, L.A., Kollars, T.M., Jr., Patton, S. and Gerhardt, R.R. 1997. Sucking lice (Anoplura) of mammals of Tennessee. Journal of Vector Ecology 22(1):71–76. Durden, L.A., Wills, W. and Clark, K.L. 1999. The fleas (Siphonaptera) of South Carolina with an assessment of their vectorial importance. Journal of Vector Ecology 24(2):171–181. Forrester, D.J. and Kinsella, J.M. 1973. Comparative morphology and ecology of two species of Litomosoides (Nematoda: Filarioidea) of rodents in Florida, with a key to the species of Litomosoides Chandler, 1931 (subscription required). International Journal for Parasitology 3(2):255–263. Forrester, D.J., Shealy, R.M. and Best, S.H. 1970. Porocephalus crotali (Pentastomida) in South Carolina (subscription required). The Journal of Parasitology 56(5):977. Foster, G.W., Cunningham, M.W., Kinsella, J.M. and Forrester, D.J. 2004. Parasitic helminths of black bear cubs (Ursus americanus) from Florida (subscription required). The Journal of Parasitology 90(1):173–175. Goldberg, S.R., Bursey, C.R. and Cheam, H. 1998. Helminths of six species of Anolis lizards (Polychrotidae) from Hispaniola, West Indies (subscription required). The Journal of Parasitology 84(6):1291–1295. Heard, R.W. and Kinsella, J.M. 1995. Levinseniella deblocki, new species (Trematoda: Digenea: Microphallidae) from salt marshes along the eastern Gulf of Mexico with notes on its functional morphology and life history (abstract only). Gulf Research Reports 9(2):97–103. Kinsella, J.M. 1971. Angiostrongylus schmidti sp. n. (Nematoda: Metastrongyloidea) from the rice rat, Oryzomys palustris, in Florida, with a key to the species of Angiostrongylus Kamensky, 1905 (subscription required). The Journal of Parasitology 57(3):494–497. Kinsella, J.M. 1974. Comparison of helminth parasites of the cotton rat, Sigmodon hispidus, from several habitats in Florida. American Museum Novitates 2540:1–12. Kinsella, J.M. 1988. Comparison of helminths of rice rats, Oryzomys palustris, from freshwater and saltwater marshes in Florida. Proceedings of the Helminthological Society of Washington 55(2):275–280. Kinsella, J.M. and Deblock, S. 1994. Contribution à l'étude des Microphallidae Travassos, 1920 (Trematoda). 46.— Déscription de Floridatrema heardi n. gen., n. sp., parasite d'Oryzomys palustris (mammifère) des Etats-Unis (abstract only). Parasite 1(1):45–50. Kinsella, J.M. and Heard, R.W., III. 1974. Morphology and life cycle of Stictodora cursitans n. comb. (Trematoda: Heterophyidae) from mammals in Florida salt marshes (subscription required). Transactions of the American Microscopical Society 93(3):408–412. Kinsella, J.M. and Pence, D.B. 1987. Description of Capillaria forresteri sp. n. (Nematoda: Trichuridae) from the rice rat Oryzomys palustris in Florida, with notes on its ecology and seasonal variation. Canadian Journal of Zoology 65(5):1294–1297. Kinsella, J.M. and Tkach, V.V. 2005. Notocotylus fosteri sp. nov. (Trematoda, Notocotylidae) from the rice rat, Oryzomys palustris in Florida. Acta Parasitologica 50(3):194–198. Kollars, T.M. 1996. Interspecific differences between small mammals as hosts of immature Dermacentor variabilis (Acari: Ixodidae) and a model for detection of high risk areas of Rocky Mountain Spotted Fever (subscription required). The Journal of Parasitology 82(5):707–710. Kollars, T.M., Jr., Durden, L.A. and Oliver, J.H., Jr. 1997. Fleas and lice parasitizing mammals in Missouri. Journal of Vector Ecology 22(2):125–132. Kollars, T.M., Jr., Oliver, J.H., Masters, E.J., Kollars, P.G. and Durden, L.A. 2000. Host utilization and seasonal occurrence of Dermacentor species (Acari: Ixodidae) in Missouri, USA (subscription required). Experimental and Applied Acarology 24(8):631–643. Kontrimavichus, V.L. 1985. Helminths of mustelids and trends in their evolution. Amerind Publishing Company, 607 pp. Layne, J.N. 1971. Fleas (Siphonaptera) of Florida (subscription required). The Florida Entomologist 54(1):35–51. Levin, M., Levine, J.F., Norris, D.E., Howard, P., Yang, S. and Apperson, C.S. 1993. Reservoir competence of rice rat and lizards for the Lyme disease spirochete, Borrelia burgdorferi. Pp. 11–13 in Apperson, C.S., Levine, J.F. and Snoddy, E.L. (eds.). Proceedings of the 2nd Workshop on Lyme Disease in the Southeast. Raleigh: North Carolina State University. Levine, J.F., Sonenshine, D.E., Nicholson, W.L. and Turner, R.T. 1991. Borrelia burgdorferi in ticks (Acari: Ixodidae) from coastal Virginia. Journal of Medical Entomology 28(5):668–674. Levine, J.F., Apperson, C.S., Strider, J.B., Jr., Levin, M., Ryan, J.R., Howard, P., Coughlin, W., Knight, M. and Yang, S. 1993. Ticks, their hosts, and Borrelia burgdorferi on the outer banks of North Carolina. Pp. 7–8 in Apperson, C.S., Levine, J.F. and Snoddy, E.L. (eds.). Proceedings of the 2nd Workshop on Lyme Disease in the Southeast. Raleigh: North Carolina State University. Lindsay, D.S., Dubey, J.P. and Blagburn, B.L. 1997. Biology of Isospora spp. from humans, nonhuman primates, and domestic animals. Clinical Microbiology Reviews 10(1):19–34. Martin, J.W. and Davis, G.E. 2001. An updated classification of the Recent Crustacea. Natural History Museum of Los Angeles County, Science Series 39:1–124. Mayer, K.A., Dailey, M.D. and Miller, M.A. 2003. Helminth parasites of the southern sea otter Enhydra lutris nereis in central California: abundance, distribution and pathology. Diseases of Aquatic Organisms 53:77–88. McKeever, S. 1971. Zonorchis komareki (McIntosh, 1939) (Trematoda: Dicrocoeliidae) from Reithrodontomys humulis (Audubon and Bachman). The Journal of Parasitology 57(4):865. Meagher, S. 1999. Genetic diversity and Capillaria hepatica (Nematoda) prevalence in Michigan deer mouse populations (subscription required). Evolution 53(4):1318–1324. Morlan, H.B. 1952. Host relationships and seasonal abundance of some Southwest Georgia ectoparasites (subscription required). American Midland Naturalist 48(1):74–93. Núñez, M.O. de. 1993. Life-history studies of heterophyid trematodes in the Neotropical Region: Ascocotyle (Phagicola) diminuta (Stunkard & Haviland, 1924) and A. (P.) angrense Travassos, 1916 (subscription required). Systematic Parasitology 24:191–199. Pisanu, B. and Bain, O. 1999. Aonchotheca musimon n. sp. (Nematoda: Capillariinae) from the mouflon Ovis musimon in the sub-Antarctic Kerguelen archipelago, with comments on the relationships with A. bilobata (Bhalerao, 1933) Moravec, 1982 and other species of the genus (subscription required). Systematic Parasitology 43(1):17–27. Pratt, H.D. and Lane, J.E., Jr. 1951. Hoplopleura oryzomydis new species, with notes on other United States species of Hoplopleura (Anoplura: Haematopinidae) (subscription required). The Journal of Parasitology 37(2):141–146. Pulido-Flores, G., Moreno-Flores, S. and Monks, S. 2005. Helminths of rodents (Rodentia: Muridae) from Metztitlán, San Cristóbal, and Rancho Santa Elena, Hidalgo, Mexico (subscription required). Comparative Parasitology 72(2):186–192. Radovsky, F.J. 2007. A new species of Ornithonyssus (Acari: Macronyssidae) in western North America and a review of nearctic species (subscription required). International Journal of Acarology 33(3):223–229. Robles, M. del R., Navone, G.T. and Kinsella, J.M. 2008. A new angiostrongylid (Nematoda) species from the pulmonary arteries of Akodon azarae (Rodentia: Cricetidae) in Argentina (subscription required). Journal of Parasitology 94(2):515–519. Schmidt, C.A. and Engstrom, M.D. 1994. Genic variation and systematics of rice rats (Oryzomys palustris species group) in southern Texas and northeastern Tamaulipas, Mexico (subscription required). Journal of Mammalogy 75(4):914–928. Simões, S.B.E., Scholz, T., Barbosa, H.S. and Santos, C.P. 2006. Taxonomic status, redescription, and surface ultrastructure of Ascocotyle (Phragicola) pindoramensis n. comb. (Digenea: Heterophyidae) (subscription required). Journal of Parasitology 92(3):501–508. Sinclair, N.R. 1971. A reviewal of Odhneria odhneri Travassos, 1921 (Trematoda: Microphallidae) (subscription required). The Journal of Parasitology 57(5):980–982. Sohn, W.-M., Han, E.-T. and Chai, J.-Y. 2003. Acanthotrema felis n. sp. (Digenea: Heterophyidae) from the small intestine of stray cats in the Republic of Korea (subscription required). The Journal of Parasitology 89(1):154–158. Sonenshine, D.E., Ratzlaff, R., Troyer, J.M., Demmerle, S.M., Demmerle, E., Jenkins, S. and Annis, B. 1993. Tick–host associations and maintenance of Borrelia burgdorferi in Virginia. Pp. 8–9 in Apperson, C.S., Levine, J.F. and Snoddy, E.L. (eds.). Proceedings of the 2nd Workshop on Lyme Disease in the Southeast. Raleigh: North Carolina State University. Tkach, V.V., Littlewood, D.T.J., Olson, P.D., Kinsella, J.M. and Swiderski, Z. 2003. Molecular phylogenetic analysis of the Microphalloidea Ward, 1901 (Trematoda: Digenea) (subscription required). Systematic Parasitology 56(1):1–15. Ubelaker, J.E. 1986. Systematics of species referred to the genus Angiostrongylus (subscription required). The Journal of Parasitology 72(2):237–244. Underwood, H.T., Owen, J.G. and Engstrom, M.D. 1986. Endohelminths of three species of Oryzomys (Rodentia: Cricetidae) from San Luis Potosi, Mexico (subscription required). The Southwestern Naturalist 31(3):410–411. Verberg, W.B. and Hunter, W.S. 1961. Studies on oxygen consumption in digenetic trematodes. V. The influence of temperature on three species of adult trematodes (subscription required). Experimental Parasitology 11(1):34–38. Whitaker, J.O. and Wilson, N. 1974. Host and distribution lists of mites (Acari), parasitic and phoretic, in the hair of wild mammals of North America, north of Mexico (subscription required). American Midland Naturalist 91(1):1–67. Whitaker, J.O., Walters, B.L., Castor, L.K., Ritzi, C.M. and Wilson, N. 2007. Host and distribution lists of mites (Acari), parasitic and phoretic, in the hair or on the skin of North American wild mammals north of Mexico: records since 1974. Faculty Publications from the Harold W. Manter Laboratory of Parasitology, University of Nebraska, Lincoln 1:1–173. Williams, D.C., Wills, W., Durden, L.A. and Gray, E.W. 1999. Ticks of South Carolina (Acari: Ixodoidea). Journal of Vector Ecology 24(2):224–232. Wilson, N. and Durden, L.A. 2003. Ectoparasites of terrestrial vertebrates inhabiting the Georgia Barrier Islands, USA: an inventory and preliminary biogeographical analysis (subscription required). Journal of Biogeography 30(8):1207–1220. Wolfe, J.L. 1982. Oryzomys palustris. Mammalian Species 176:1–5. Worth, C.B. 1950. Observations on ectoparasites of some small mammals in Everglades National Park and Hillsborough County, Florida (subscription required). The Journal of Parasitology 36(4):326–335.